You might presume that an alcoholic is a person who is mostly drinking, has no hope of earning a good life and is a total failure, but this is a common misconception. That’s not the case with a functioning alcoholic. 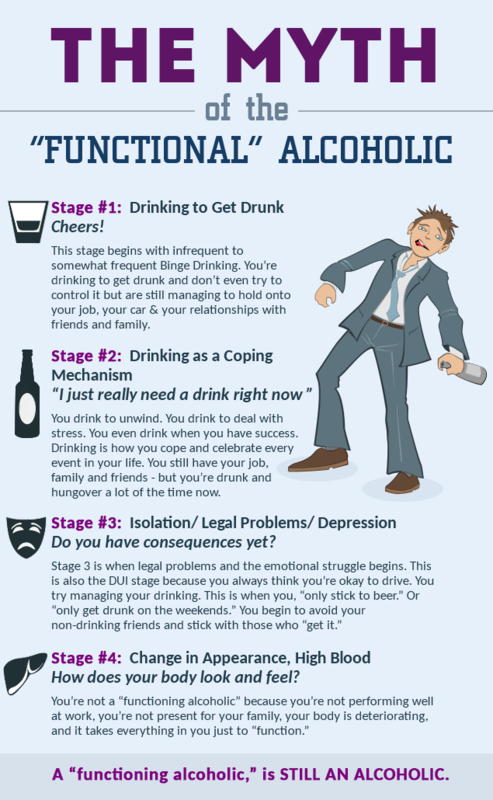 But what is a functioning alcoholic? A functioning alcoholic is someone who abuses alcohol but is still successful in maintaining their life, family, and career. The National Council on Alcohol and Drug Dependence (NCADD) concluded that 20% of the alcohol addicts in the U.S. are functioning alcoholics. A functional alcoholic is a tricky and intelligent person who has a stable life, family, successful career and yet drinks like there’s not tomorrow. In research by the National Council on Alcohol and Drug Dependence (NCADD) concluded that 14 million adult citizens of United states– one out of every 13 – have an Alcohol Abuse Disorder. The surprising fact is that, out of these alcoholics, a whopping 20% are the functioning type. The first answer that comes to your mind is NO. Well, the majority of functional alcoholics have a firm belief that they are not alcoholics as they are in denial. These individuals come out of denial on facing a situation that usually is heartbreaking. They think having a stable and prosperous life is a clear indication that they are not alcoholics. However, that may not be the case. These individuals drink a lot as soon as they finish work. Functioning alcoholics are invisible in a matter of fact as they have developed resistance to alcohol and usually show no sign of being drunk, which makes it much harder to spot an alcoholic in this case. They are intelligent, well-educated and hardworking and this is one of the reasons for not showing the signs of being drunk. • Alcohol is the first thing on your mind after work. • You end up drinking more than one glass of alcohol. • You feel shaky in the morning. • You hide your alcohol. First of all, ask yourself what is the first thing that comes to your mind after finishing work or reaching home? If your answer is consuming alcohol; you might want to consider the odds. Do you sit down to have just one glass and end up in consuming far more than one? Do you have blackouts? It means you forget what you said and did. Do you feel shakiness in the morning? Do you hide your alcohol? If your reply to the above questions is yes, then I would advise you to consult a doctor as soon as possible. Do you know that being a functional alcoholic doesn’t only put you at risk of harming yourself but your family and loved ones as well? These individuals usually start increasing their intake of alcohol due to the presence of some stress, a relationship problem or losing a cherished one. Later on, this can become a habit of beer abuse or any other alcohol dependence, and then changes to a medical condition that puts them in a denial stage. In 2013, NY Times published a story: A ‘Perfect Mother,’ a Vodka Bottle and 8 Lives Lost about a 39-year old mother named Diane Shuler, who died in an accident as she was under the influence of alcohol. She was a high functioning alcoholic. In this sad incident, her son and three nieces also died. The story shows how functioning alcoholics can not only risk their life, but also the lives of others around them. Can I control my condition of functioning alcoholism? This might come as a blow, but the answer is NO! Most of the individuals who try to stop or reduce the intake of alcohol end up either drinking more as they get depressed and sometimes end up causing unbearable damage to someone life. Take the example of Diane; had she lived, she would never have forgotten the sad outcome of the accident that she caused. With the passage of time, the body tolerance to alcohol increases and the consumer drinking more and more due to increased stress caused by career growth (enhanced responsibilities). There comes a time when performance and health damages begin to deteriorate. Profound alcohol dependence is visible at this stage. Wondering how it would be to live with an alcoholic? Usually, families of such people are not satisfied with them. A functioning alcoholic can be an aggressive person who rarely gives time to others. Living with an alcoholic husband often results in either a broken marriage or relationships. The individual usually suffers from depression, social phobia, anxiety, and eating disorders. They may seem sociable while at work but will prefer to drink alone at the bar or home drinking. Functioning alcoholism is not sustainable. A functioning alcoholic who tries to quit drinking may only end up drinking more to cope with withdrawal symptoms. In the long run, functioning alcoholism will only lead to increased consumption of alcohol, and eventual deterioration in the workplace, home life, and overall well-being are inevitable. The functioning alcoholism is dangerous, and so the person should be encouraged to figure out a way to reduce the consumption with the support of loved ones or family. Conversations on drinking habit are vital in this process. If the patient is receptive to his loved one concern and is willing to curb the habit of drinking, then you should seek help. The first and foremost thing to do is encourage him/her to consult another specialist. An alcoholic is a danger to not only himself but also to his employer. A functioning alcoholic is usually absent from work. His duties are either handled by coworkers or remain pending. This is a big loss for the firm. Therefore, it is recommended that the patient should be given medical treatment even at the expense of the firm. Alcohol withdrawal is very challenging, so it’s a better choice to opt for medical detoxification. The term medical detoxification means providing medicines, specific diet plans, and vitamins to make the withdrawal process less painful. Help is available at different government awareness sights. National Council on Alcoholism and Drug Dependence provides support and assistance to alcoholics. Different medical options are available in the United States of America. National Council of Alcoholism offers medical attention to the five different types of alcoholics. A strong will is essential for the individual to recover from functioning alcoholism. Treating functioning alcoholism is comparatively easy as the person is still in control of their life, and rehab is hardly ever needed. But depending on your situation, you may consider talking to your doctor or health professional for a customized solution to your condition in the alcohol treatment facilities. It may be an alcohol abuse counseling, inpatient or outpatient rehabilitation facility or any other individualized approach. AlcoRehab » What is Alcoholism? A Complete Guide to Alcohol Addiction » Are You a Functioning Alcoholic?